Habit: Subshrub or shrub. Stem: wand-like to much-branched. Leaf: drought-deciduous, +- opposite or in 3s, distal occasionally alternate; sessile to short-petioled. Inflorescence: panicle or spike-like; bracts reduced. Flower: calyx lobes 5, +- equal; corolla +- white, +- yellow, or red, short-glandular outside, upper lip +- hooded, 2-lobed, lobes rounded, external in bud, lower lip rounded, lobes often reflexed; stamens 4, filaments attached at 1 level, densely nonglandular-hairy at base, anthers small, glabrous, anther sacs generally spreading flat at dehiscence; staminode well developed, glabrous to densely bearded; nectary a disk; stigma unlobed. Fruit: septicidal and sometimes also loculicidal at tip, ovoid. Seed: many, irregularly angled. Species In Genus: 7 species: especially California, western Nevada, western Arizona, Baja California. Etymology: (David D. Keck, California botanist, 1903--1995; Keckia used earlier, for genus of fossil algae) Note: Red-flowered species are hummingbird-pollinated. Stem: spreading to erect, 6--25 dm; young stems canescent (glabrous). Leaf: +- opposite, in axillary clusters on older stems; blade 5--20 mm, (ob)lanceolate to narrowly (ob)ovate, base tapered, margin generally entire. Inflorescence: finely short-hairy and sparsely glandular. Flower: corolla 15--23 mm, yellow (drying +- black), tube + widely expanded throat 6--10 mm, upper lip 8--15 mm; anther sacs 1.1--1.8 mm; staminode densely yellow-hairy, exserted. Habit: Plant canescent. Flower: calyx 5.5--9 mm, lobes lanceolate, tips acute to acuminate; anther sacs 1.1--1.5 mm. 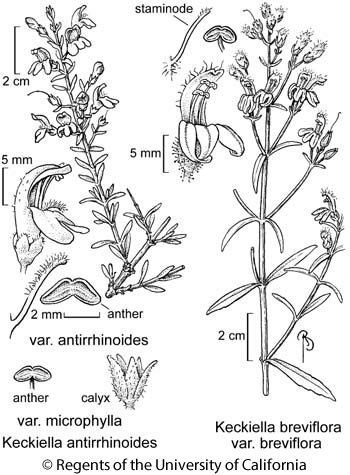 Unabridged Note: As Penstemon antirrhinoides Benth. subsp. microphyllus (A.Gray) D.D.Keck, indicated as well for Baja California by Wiggins (1980. Flora of Baja California). Citation for this treatment: Margriet Wetherwax & Noel H. Holmgren 2012, Keckiella antirrhinoides var. microphylla, in Jepson Flora Project (eds.) Jepson eFlora, http://ucjeps.berkeley.edu/eflora/eflora_display.php?tid=76785, accessed on April 19, 2019.